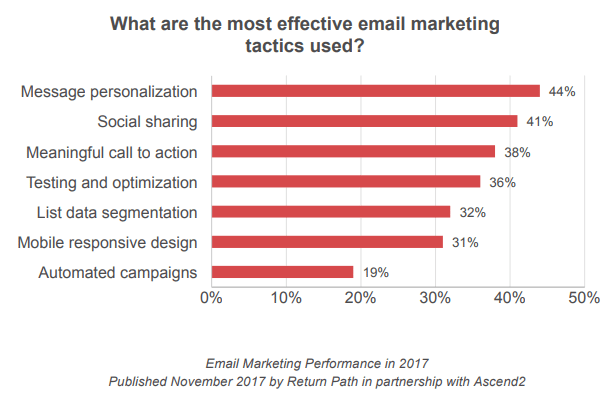 It comes as no surprise, that highly personalized emails can generate the highest engagement and according to a recent study done by Return Path on the Email Performance in 2017, marketers believe personalization is the most effective email tactic. However, many emails received by subscribers today still have the feeling of a mass email, sent to the entire list, with little to no personalization. As subscribers begin to expect a highly relevant and personalized email experience, these mass emails have begun to fall short, not as effective in generating response or revenue. While you may not have the ability to create a fully data driven email experience, commit to adding some level of personalization to your email program. 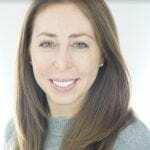 Whether it’s through the use of automated triggers based on browse behavior, or dynamic product recommendations, or even personalization based on location or gender. Also, using tactics like content based on current events or weather can be an easy, creative way to bring a sense of relevancy to the message. As mailbox providers become stricter with their filtering, relying heavily on engagement data to determine folder placement, it’s extremely important to put inactive rules in place. Most marketers do have some type of rule in place; however, often we see these rules broken, especially when sending out emails around the holidays or other special times. As a general rule of thumb, mail to the most engaged portion of your list, ideally anyone that has opened or clicked an email in the past six months – and ditch the old, inactive names by removing them from your file. However, as with any email element, testing is key. So test a few different thresholds to see which provides the best outcome, and helps improve your inbox placement and even implement different rules based on mailbox provider, or list source. Often times as marketers, we create email templates or triggered messages and then rarely touch or update them. The beginning of the year is the best time to take inventory of your current messages and bring fresh enhancements to the design and content. As more and more messages are read on mobile devices, it’s imperative to review your templates and ensure they are designed with mobile in mind. Make sure your font is easily readable, avoiding long paragraphs of text, and include large, eye-catching call to actions links. Also, make sure your content is engaging and your images and headlines are up to date and all links are still functioning properly. Another great way to bring updated content and tactics to your emails is through the use of fun, interactive elements such as animated gifs or countdown timers. While we all know the importance of testing, more often than not this may fall to the bottom of our to do list, as other urgent matters come up. However, testing is critical to any successful email program and even small, easy to implement tests can uncover helpful ways to optimize your program. Some of these tests include time of day or day of week testing, call to action verbiage and placement, and simple subject line tests. So start small, committing to run at least a few tests each month, and remember to run the same test at least three times to uncover accurate results. So while working on your email roadmap for this year, remember it’s okay to start small and be sure to add these email best practices to your list. Here’s to a fabulous and profitable year!